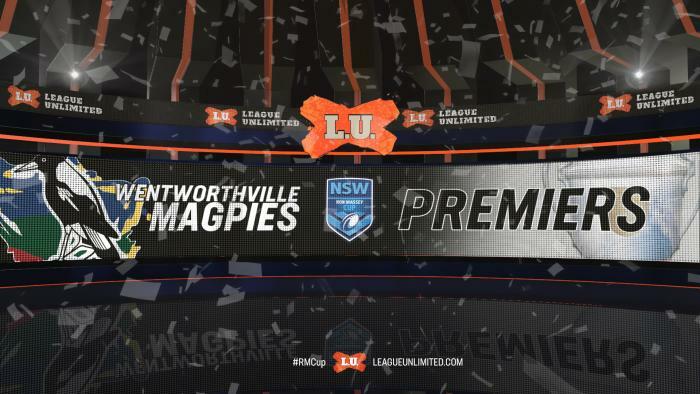 Wentworthville Magpies have claimed back-to-back Ron Massey Cup premierships - and the sixth title in the club's history, in the competition's current format - downing St Marys 38-4 in the 2018 decider at Leichhardt Oval. A controlled performance from the Magpies' No.7 Beau Henry, the 2018 Ron Massey Cup Player of the Year, lead Wentworthville to the eventual 34-point win - the 38-4 scoreline mirroring their 2017 success over the Auburn Warriors. Wentworthville opened their account courtesy of noted try-scorer Joshua Minhinnick, who crossed in the seventh minute of play. Halfback Henry's conversion attempt was waved away and the Magpies retained their four-point advantage. St Marys were quick to reply and did so when fleet-footed winger Allan Fitzgibbon finished off a well-worked backline shift to level the scores at four. St Marys' Five-Eighth Jake Toby was unable to add the extras as the score remained at 4-4. In a back-and-forth first quarter, both sides traded blows in search of the upper-hand. Wentworthville stuck next on the scoreboard as centre Nathan Milone surged over the line to grab the side's second try. Henry's conversion was successful and the Magpies lead 10-4. Two tries in a three-minute window rocketed Wentworthville to a 16-point front - Minhinnick snared a double with a length-of-the-field effort in the 32nd minute, before Abbas Miski darted over from close range to extend the lead outside two converted tries. Henry converted the Miski try to give the Magpies a 20-4 lead, which they would take in to half-time. Needing to start the second-half on the front foot, St Marys did the exact opposite - Fitzgibbon spiled a spiralling kick down-field to gift the Magpies a golden attacking chance, which they capitalised upon. Hard-running centre Atini Gafa added to St Marys' woes with his 47th minute try, and again Henry made light work of the conversion. With 30 minutes to play, the Magpies lead 26-4. Trailing by plenty, St Marys' effort didn't waver - but any threat of a come-from-behind victory was put to bed when Blake McDermott was sent to the sin-bin for a dangerous tackle. Playing with the numerical advantage, Wentworthville's Milone bagged a brace before James Gammidge continued the run of points with his try in the 69th minute. Henry slotted the pair of goals to take the score to 38-4, as it would remain at full-time. This match report by Ryan Selvage originally appeared at NSWRL.com.au. RELATED: See the full list of 2018 Ron Massey Cup Draw and Results. RELATED: Click here to view the current Ron Massey Cup ladder.